Seasons are an integral part of SP Membership. All member registrations and all competitions must be linked to a season. When a member is registered into a season, it creates a new 'season record' for that member. 1. Open the member's record. 2. Click on Member History in the menu and select Seasons. 3. The member's 'Season Summary' page will appear. The information on this page will be broken down into 3 areas - (1) Association Summary, (2) Club Summary, and (3) Full Summary (combination of both Association and Club season information). If the member has participated in a season at association or club level but does not have a record for that season, you can add it in: To add a season record at the association level, click on Add Season Record below 'Association Summary'. 1. To add a season record at the club level, click on Add Season Club Record below 'Club Summary'. a. Participated in this Season: leave this box checked. b. (Association / Club) Season Member Package: Please note that Member Packages have been superseded by 'Products', which has far greater functionality and integration with other features of Membership. However if you are using 'Member Packages' in your database, you can choose to assign a member package to the member's season record. c. Age Group: Assign an age group to the member's season record. d. Association options: Player, Player Financial, Coach, Coach Financial, Match Official and Match Official Financial. Select the member type and financial status for the member's season record. 3. Click on Update Season Summary. 4. A message will appear confirming the addition of the new season record. Click on Return to Member Record. 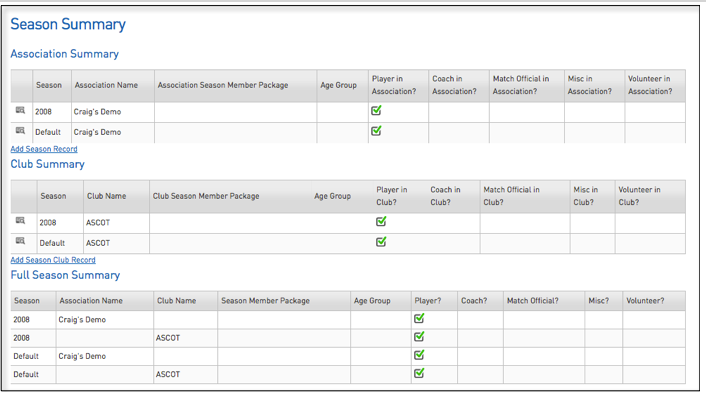 An association is able to edit a member's season information at both the association and club level. 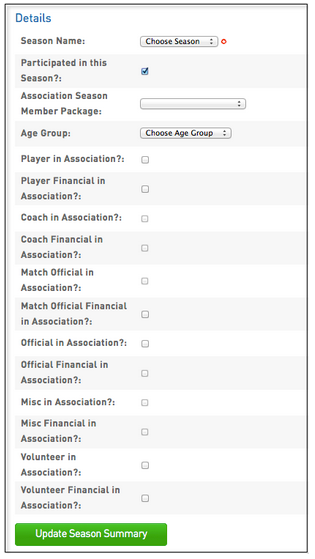 A club can edit a member's season information at their own club level. 3. The member's 'Season Summary' page will appear. Go to the Association Summary or Club Summary and find the season record that you want to edit. Click on the Edit icon next to the season record that you want to edit. 4. The season record will open. Click on Edit Details. 5. The following fields are read-only and cannot be edited - 'Season Name', 'Club Name' and 'Date Player Created in Club'. All other fields can be edited. Update the editable fields and click on Update Season Summary. 6. A confirmation message will appear - 'Record updated successfully'. Click on Return to Member Record. Some season information can also be edited from the member list.